I was moody when I was fifteen. Weren’t we all? I walked through my high school’s hallways as if I were walking on a tightrope between anger and sadness. The slightest thing would push me in either direction and I’d stay that way for days, confused as to what happened to land me there. I was in an all-girls Catholic school long after I had stopped being Catholic. I was moody because I didn’t want to pray every morning, because it was hard for me to make friends, and because we had to wear ugly plain green uniforms that didn’t go with my Hot Topic personal brand. I was moody because my father was overseas in Iraq, because my grandmother had just died, and because I just really hated doing step aerobics in gym class. So most of this could be chalked up to that typical teen angst that everyone is required to experience in order to prepare them for the teen angst that stays with you well through adulthood. But some of it was different. Sometimes the noise would completely drop out and I couldn’t catch my breath; I often thought I was dying — I had written three separate will and testaments by age 21 — but I never did. It would be two years before I learned that these were panic attacks and two more after that before I learned that pills could help. Back then, I’d spend a few hours laying around in the nurse’s office listening to a burned copy of Bleed American on my discman. I started missing school for days at a time, and then full weeks. I would have been kicked out if they didn’t need my tuition money for fancy rosary beads. There were times when I was actually sick — a chronic illness that would later result in multiple throat surgeries — but sometimes, most often, I just couldn’t find a reason to leave my room. At home, I spent hours on the internet updating online journals where I overshared my Teen Problems with strangers — clearly, a habit that I’ve yet to kick — and printing out brochures on homeschooling, casually leaving them around my parents’ house the same way I’d leave around pictures of adoptable dogs when I was younger. But I listened to Bleed American almost every single day, I stared at the computer, and I cried too much — because what else do you do when you’re fifteen? I didn’t understand anything when I was a teenager: the reasons why I was crying, the way in which my brain worked differently, or any of the words on my Spanish homework. I didn’t understand half of the songs on Bleed American but I knew that it was important, somehow, and I knew that I loved it. Jim Adkins told me that everything, everything would be alright and I believed him. But I did understand “The Middle.” Everyone with a radio in 2001 understood it. It was one of the cheesiest songs that I’d ever heard, the emo equivalent of a motivational poster hung on the wall of a guidance counselor’s office. But I still loved it. “The Middle” is the song that Jimmy Eat World wrote specifically for you. No one else, aside from these dorky guys from Arizona, understood what it was like to be an awkward teenager who didn’t fit in with the rest of the school. No one else understood why you were confused, a step behind someone else, and constantly craving reassurance but unable to seek it out. This is all false, of course: “The Middle” was the song that you’d listen to alone on your bedroom floor while feeling left out by the hundreds of other students who were also listening to the same song while sitting alone on their bedroom floor and feeling left out. “The Middle” was your song but it was also everyone’s song. 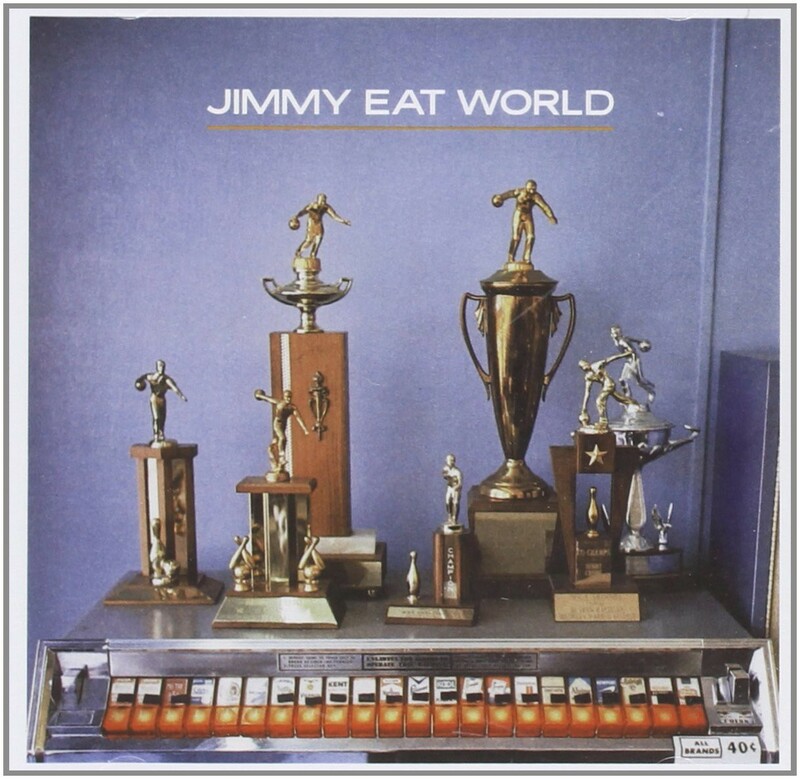 It’s tough to talk about Jimmy Eat World, or any band from your teen years, without getting sucked into nostalgia. I try to reject nostalgia because it’s not healthy for my mind to get stuck in a trap of missing things that I can’t ever get back. But I get accused it often, no matter how often I explain that I don’t actually remember the ‘90s. I listen to pop-punk almost exclusively and it’s not because I’m trying to rekindle the feeling of being fifteen — who the hell wants that? — but because I’m so fucked up that I can’t actually outgrow this music. Bleed American is somehow more important to me now than it ever was a decade ago. In high school, “If You Don’t, Don’t” never socked me in the gut the way it does now, out of nowhere, when my phone is on shuffle on the subway and I start crying on the R train. At 15, I was never hyper aware of how close two people’s hands could be without actually touching, or how quickly you can drink a paycheck dry without realizing. Now this is all second-nature: apologizing for being a mess, for being broke, for not loving someway the way you wish you could; apologizing while slurring and hiccupping and hoping it’ll be OK the next day or, at least, that everyone else was so drunk they don’t remember. The album’s opener — and it’s title track, depending on which year you bought the record; it was temporarily retitled after 9/11 — “Bleed American” appeals to me so much that it’s both comical and embarrassing: “I’m not alone ‘cause the TV’s on / I’m not crazy ‘cause I take the right pills every day.” It’s a mantra that I sing basically every morning: It’s hard not to because I spend all day watching television in an empty living room and I take medicine that’s supposed to right the wrongs that exist inside of my own brain. Sometimes they work; sometimes they don’t. There are songs like “A Praise Chorus,” which is my absolute favorite, where Adkins turns the focus away from being a teenager and toward the next lost period of your life: “Even at 25, you gotta start sometime.” Jimmy Eat World is a band that’s seemingly obsessed with being in their twenties. Songs about being unpopular in high school double as songs about feeling directionless as an adult. Two years ago, in the weeks leading up to my twenty-fifth birthday, I became re-obsessed with this album and wondering why it was hitting me so hard. It all boiled down to insecurity: I’d been feeling fucked up and immature and left behind. I was jealous of people with two-year leases and actual careers; I was jealous of people who remembered to sort their recycling, or to take off their shoes before falling asleep. I’d later realize that everyone felt the same way.